Let your friends know that your place is considered a good time Irish Pub, thanks to our personalized beer mugs with the eye-catching "Irish Pub" logo. Before friends enjoy a frosty serving, they'll know the year and name of your Irish Pub that lead them to many good times, since you can personalize both. Drink with the best of the Irish! 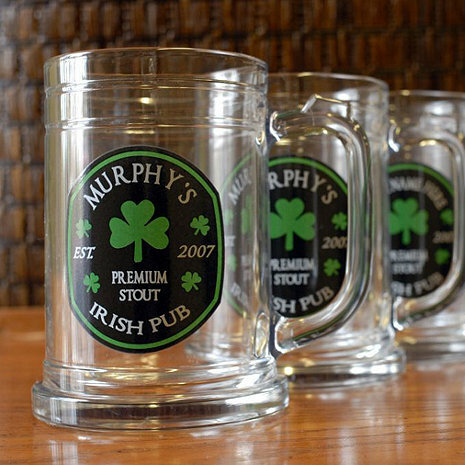 Let your friends know that your place is considered a good time Irish Pub, thanks to our personalized beer mugs with the eye-catching "Irish Pub" logo. Before friends enjoy a frosty serving, they'll know the year and name of your Irish Pub that lead them to many good times, since you can personalize both. Machine made of lead-free glass, decal contains some lead. Recommend to hand wash.
Personalize the name up to 14 characters, including spaces/punctuation. Also personalize the year up to 4 characters. Font size, color or position can not be changed. Graphic and sayings are standard and also can not be changed or removed. the glasses were beautiful but instead of sayin wally's irish pub there was no apostrophy s. they said wally irish pub. This was a horrible ordering experience! I ordered these for Christmas presents and I placed the order on Nov 11 and after 3 calls to customer service because a week before xmas they still hadn't shipped. The third time I called they basically told me the vendor just never sent them. I did end up getting them 3 days before xmas, but it was ridiculous that it took so long. After the second try, it was right. After reading the reviews, we noticed that someone had an issue with the "apostrophy s." We were ordering twelve mugs. Before we placed the order, we called to confirm that we did not need to add the "apostrophy s" and that it would automatically be added to the last name. We were told not to add it. However, once we received the order, it did not have an "apostrophy s" and the label was crooked. After calling three times and a few emails, I finally got in touch with someone that fixed my order and shortly after they arrived and were exactly as pictured. So make sure you add the "apostrophy s."
This was exactly what I thought it would be and am very happy with the final product. After reading the reviews I made sure to add the s after the name (i.e Smith's, not Smith). The glasses are nice and heavy with the printing job done flawlessly! Haven't used yet but they did arrived as ordered and they are good looking mugs. Would be nice if there was an accompanying rack to display them on. I bought the pub classes as a gift for my uncle. He built a pub in his house and loves entertaining in there. He is a proud irish man and loves to share his culture-the pub glasses fit for the occasion. The only negative I saw in the glasses, was the writing wasn't completely centered on the glasses and the 's was slanted and didn't look like it was a part of the name. Overall, the product worked for the price-thanks! Day we received the product, one glass was dropped into the sink (less than a foot) and it shattered. Although the glass seems thick, it was not very durable.